The Quartzlock E10-P Portable Rubidium Frequency Reference, is a miniature rechargeable Atomic Clock with 10MHz sine-wave 50 Ohm output. Recharging / operating from internal 12Vdc, this miniature enclosure, only 103 x 55 x 122mm has all the performance needed for on-site calibrations, referencing and portable transfer standard applications. Quartzlock's SMAC (sub miniature atomic clock) technology far outperforms chip scale atomic clock devices with poor AVAR & phase noise. The E10-P benefits from simple operation just connect output BNC connector to device under reference. Operation to warm (3min) from 12V car supply, in transit to on-site application, saves the higher power warm stage. The E10-P is hand held, with <500g mass, and is one of the smallest & lightest atomic clocks with -95dBc/Hz Phase Noise and 8 x 10-12/100s Stability. (100 x better than any OCXO). No antenna is required or view of sky as the E10-P is a completely independent atomic reference. The E10-P is a low cost, compact portable rubidium frequency reference capable of operating from external DC or internal batteries. 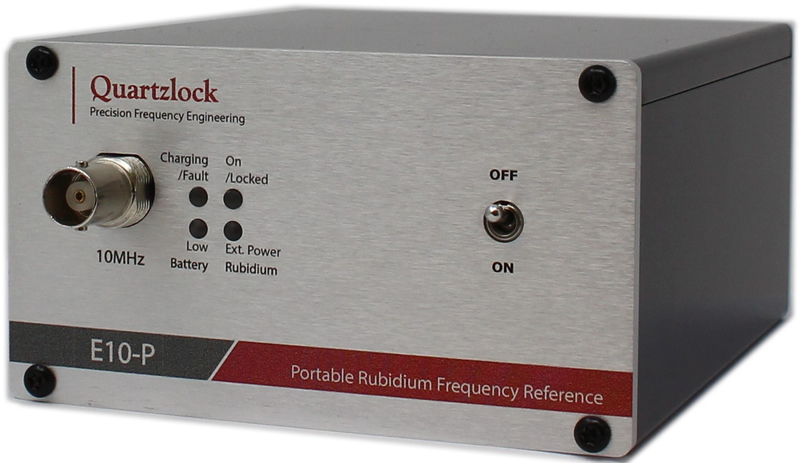 With Quartzlocks SMAC rubidium oscillator at the heart of this instrument it provides the user with a precise frequency reference whereever required, capable of operating for hours with its internal batteries it makes an ideal reference for field service engineers for remote cellular base stations.